Catanduanes is an island province of the Philippines located in the Bicol Region of Luzon. Its capital is Virac and the province lies to the east of Camarines Sur across Maqueda Channel. As of the 2010 census, the population of the province is 246,300 people. The island province was among the 42 provinces in the country listed as “Peaceful and Ready for Development” last year 2014. The province consists primarily of Catanduanes Island (also called Virac Island), but also includes Panay Island and a few other minor surrounding islets. 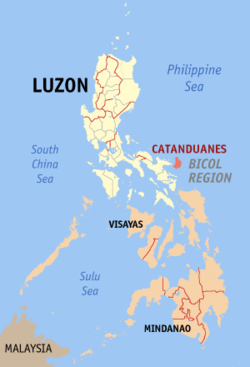 Catanduanes is situated in the easternmost fringe of Luzon: 13.3 to 14.1 degrees north latitudes and between 124.1 to 124.3 degrees east longitudes. The island bounded on the west by the Maqueda Channel, on the south by Lagonoy Gulf, and on the north and east by the Philippine Sea. Several islands compose the province, but beside the main island, they are all too small to be of relative significance. Its aggregate land area totals approximately 1,511.5 square kilometers or 151,150 hectares. The coastlines, that stretch to almost 400 km (249 mi), are jagged with many bays. The topography of Catanduanes Island is rugged and mountainous, becoming more pronounced towards the central portion of the island. Less than 10 percent of the land area has a slope gradient under 8 percent, mostly fractured and narrow strips of plains located along the coastal areas where most of the inhabitants are settled. The highest mountain peak is in Boctot, located between the municipalities of Virac and San Miguel with an elevation of 803 metres (2,635 ft) above sea level. It is the premier mountain range with broadly spread old growth forests and watershed which exerts widespread influence over its immediate environs that include the municipalities of Virac, Bato, and San Miguel. Other prominent mountain forms with important significance include the ranges: Obi in Caramoran, Cagmasoso in San Andres, and the Summit and Magsumoso ranges within the Viga and Gigmoto areas. The lowlands include the Virac Plain, Viga Plain, San Andres Plain and the Bato River Flood Plain. The coastal municipalities with limited lowland agricultural areas are Pandan and Caramoran. The more extensive lowlands are found in the southern parts of the province. The largest coastal plain is the contiguous wetlands of Viga, Panganiban and Bagamanoc over which lays the widest area of rice paddies and nipa mangroves. The province is mostly rugged and mountainous terrain. Its slope characteristics are 13% gently sloping to undulating, 1% classified rolling to hilly, 2% very hills and mountains, 47% level to very gently sloping, 32% steep hills and mountainous, and 5% undulating to rolling. Ten of the eleven municipalities of the province are situated along the coastal fringes, over which locate its mostly fractured plains. The only landlocked municipality is San Miguel with its poblacion [town center] sitting in a location entirely devoid of flat lands. The majority of the built-up areas occupy zones that are classified as flat to rolling. Roman Catholicism is the religion of the vast majority, comprising 97% of Catanduanes population. The remaining faith of Catandunganon people are divided with the various Protestant groups such as Baptists, Methodists, other Evangelical Christians, Mormons, Jehovah's Witnesses, Iglesia ni Cristo as well as Moslems. Agriculture, fishing and tourism is the other source of living in this beautiful island. Several handicrafts, jewelry manufacturing, other small-scale industries and manufacturing enterprises also one of the contributors to the province's economy. The province is rich in natural resources, forests, waterfalls, rivers, mineral deposits and productive soil made fertile by volcanic ashes of distant Mayon Volcano. Rattancraft, fishing, buri hat and mat making and abaca fiber craft are its most and among the important industries of the island. By comparison, the prevailing peace and order situation in the province is much better than that of the other provinces in the region. This is attributed to the inherent affable character of the Catandunganons, the all-out government support and a vigilant religious hierarchy. To arrest attempts of criminal elements to make the province a market for illegal drugs, the police force with the support of LGUs launched a massive information campaign for a better-informed citizenry. Police Services - The Philippine National Police in the province is composed of the local police force and the fire brigade’s services. Among its objectives, the PNP organizes missions to protect lives and property, enforce laws and maintain peace and order; to prevent crimes and to investigate the commission of all crimes and offenses and to bring the offender to justice; And finally, to take the necessary measures to prevent and control fires and to maintain public safety. The prevailing peace and order remains the best argument for promoting the province. The province crime rate is 6.39 in 2006. Crime volume over the same period was 191.